1.This series machine adopt microcomputer control full digital broadband electro-hydraulic servo valve to drive high precision hydraulic cylinder, auto control to test force, displacement, deformation, and finish tension, compression, bending test. 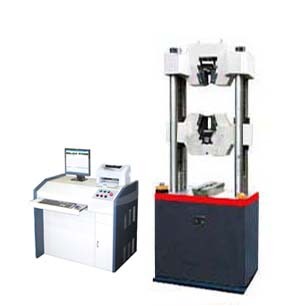 This series machine comply with national standard GB/T228-2002 Method of Tensile Test of Metallic Materials At Room Temperature and GB/T3159-92 Hydraulic Universal Testing Machine. If equipped with accessories, can perform mechanical property test for high strength bolt, chain, steel wire and other materials. 2.The main machine adopts underneath hydraulic cylinder; the power to adjust test space and transmission devices are installed at the bottom of the main machine, running stably; upper and lower jaw base are open structure, easy to clamp specimen. 3.Independent hydraulic servo loading system, using high precision broadband electro-hydraulic servo valve to ensure system high precision, high efficiency, low noise, quick response; using independent hydraulic clamping system to ensure system run stably and low noise, and no-slipping of specimen during test. 4.Computer control, completely realizing three closed-loop control to test force, displacement, strain, test procedure control, data acquisition, processing, analysis (test data including: elastic modulusE, tensile strength Rm, upper yield point ReH, ReL etc. ), accurate, reliable.